Project Management Team of the Year! 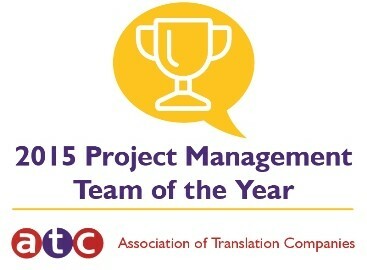 We’re very excited to be named Project Management Team of the Year by the Association of Translation Companies (ATC)! Their inaugural Language Industry Summit Awards were held in September at Old Trafford and James Brown, Account Manager here at Comtec was there to pick up the award in person. Of course, let’s not forget our global network of professional, hardworking and dedicated linguists who we work with closely on all of our projects. Last year we organised a translator open day, attended by more than 40 of our linguists. This was a huge success and provided an opportunity to celebrate the longstanding partnerships we have with our linguists. We’ll be organising another event in 2016, so watch this space! Our dedicated approach to project management is just one of the many ways we deliver high-quality translations and excellent customer service to our clients. We are ISO 9001:2015 certified and recognised by ISO 17100:2015, the translation industry’s quality standard. We also utilise sophisticated translation memory technology and related tools to improve quality, reduce costs and speed up turnaround times for our clients, all of which is reflected in the quality of our service. We’re so pleased to have won the Project Management Team of the Year award and look forward to many more years of excellent work and quality project delivery for our clients.